Our family loves pasta. Our oldest child claims that olives are his favorite food and has been known to sit and eat a bunch of them all at once. 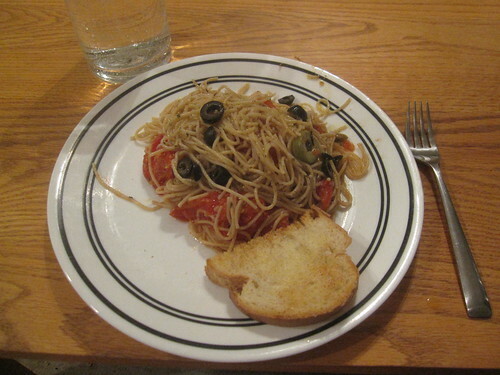 Thus, pasta with olives is something that frequently hits our table. This is a very simple dish, so you don’t need too many ingredients. We had almost all of this already on hand before we even decided to prepare this meal, so our cost was really low. If you were to buy all of this at the store, and using my best estimates of prorating the ingredients, you would have a total cost of around $6 to prepare a dish that will easily feed a family of four and provide lunch leftovers for two. You really don’t have to do anything the night before unless you’re really itching for something to do. The only advance prep you might consider doing is slicing the olives and storing them in the refrigerator. 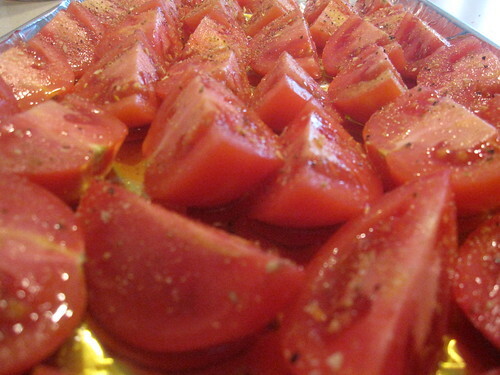 Preheat your oven to 450 F. Get your tomatoes out and cut them into halves or quarters, your choice. I used quarters because they’re easier for our kids to manipulate. After that, dash the tomatoes with garlic powder, putting a light amount all over, then repeat lightly with salt and with pepper. When the oven is done preheating, put the tomatoes in the oven for 35 minutes until they’re cooked and perhaps very gently browned or blackened on the edges. I pull them out a bit earlier because the children recoil at the sight of anything burnt (unfortunately, because I like that gently singed flavor). While the tomatoes are cooking, cook and drain your pasta according to the directions, then add 1/4 cup olive oil (you can add more if you’d like), the olives, a teaspoon of dried basil, a dash or two of salt, and a dash or two of pepper to the pasta, then mix thoroughly. When the tomatoes are finished, add the tomatoes and mix thoroughly. Serve. We also took a bit of leftover Italian bread, sliced it, spread a bit of margarine on each piece, and sprinkled a bit of garlic on them. We spread the slices out on a cookie sheet and put them in the oven with the tomatoes for the last ten minutes. It came out nice and crispy and allowed us to use the tomatoes in the pasta to make a type of simple bruschetta right at the dinner table. Here are some optional ingredients to give this dish some extra oomph. Parmesan cheese Freshly grated tastes the best, but you can use whatever you like. 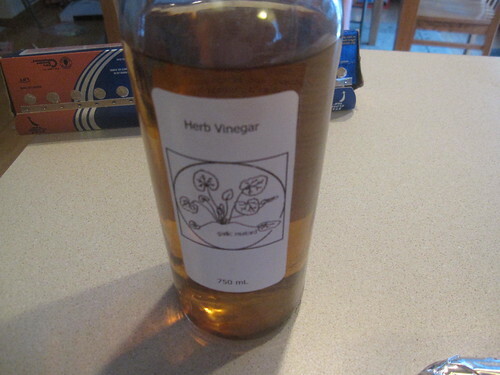 You can either sprinkle it right into the mix or else sprinkle it on top when the pasta is on your plate. Diced pepperoni My wife, who loves her pepperoni, suggested simply dicing up some pepperoni and tossing it in near the end.